2. Have a professional snake your drains with a tool that will remove blockages and clean out your pipes. 3. Use a plunger when experiencing clogged drains but follow that up with a professional investigating why the drains are getting clogged. 4. Limit what you put down your kitchen sink, especially anything greasy or fibrous. 5. Throw away items that are best meant to be in the trash as opposed to being flushed. 6. Avoid using too much toilet paper when going to the bathroom. 7. Hire a professional to periodically evaluate and provide maintenance to your pipes. 8. Consider having your pipes replaced if they are old and not as efficient as they should be. 9. 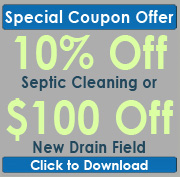 Have your septic system pumped regularly. If it gets too full, it can cause drainage issues, and even lead to backups. 10. Schedule septic tank maintenance routinely so that you don’t have to wait for a major issue to happen but can be proactive about making sure your system is in good condition. By following these steps, you should not experience drainage issues, and if you do they should be easy to fix.